I love loaded nachos so I went searching for a healthy alternative. These are really yummy and can be topped with variety of ingredients depending on your preferences. Directions: Preheat oven to 425F and lightly spray a baking sheet with cooking spray. Wash and dry your sweet potatoes, then use a vegetable peeler to peel them. Slice them into 1/4 inch rounds and place in a large bowl. Drizzle with olive oil. Season with paprika, garlic powder, and salt and pepper, and toss well. Place potatoes in a single layer on your baking sheet. Bake for 40 minutes, turning them over halfway through to ensure they don't burn. Remove from oven and transfer rounds to a cast iron skillet or oven safe dish, allowing the edges to slightly overlap. 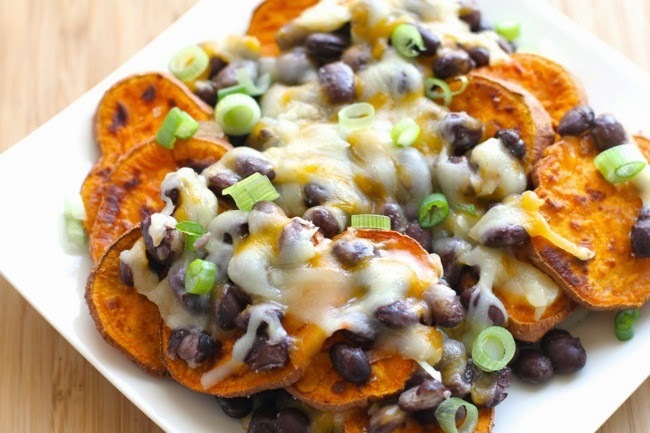 Top with beans and cheese before returning to the oven for an additional 5 minutes, or until cheese is melted. Remove from oven and sprinkle with chopped green onions. Serve with avocado, Greek yogurt or sour cream, and salsa.